The centuries-old craft of marquetry will add richness and beauty to all of your creative woodworking projects—and mastering marquetry is easier than you think! Veneer is easy to work with, doesn’t require a lot of equipment or space, and allows a woodworker or crafter to create or embellish a project with rare woods at an inexpensive price. Basic Marquetry and Beyond is for today’s active hands and creative minds ready to discover just how easy this classic technique can be, no matter what your skill level. With 36 projects, from a simple set of bookmarks to a challenging cone-shaped bowl, Basic Marquetry and Beyond, by master craftsman Ken Horner, will help any beginner quickly feel like a pro, while experts will learn valuable new marquetry tricks. Every step is clearly explained, while more than 250 images, easy-to-follow patterns, and veneer recommendations take the guesswork out of marquetry technique. Basic Marquetry and Beyond is a must-have guide for everyone who wants to create beautiful original projects or embellish their woodworking with stunning handcrafted style. DVD -From customizing tools to cutting layered veneer, bring the secrets of world-class furniture decoration into your shop. A rich history of marquetry is presented in context by one its most ardent and talented proponents-- Silas Kopf, himself a distinguished cabinetmaker for more than thirty years. Foreword by Glenn Adamson, Head of Graduate Studies and Deputy Head of Research, Victoria Albert Museum, London. This is a comprehensive introduction to decorative veneering. It includes an overview of the art, tools, techniques and trouble-shooting solutions. Schurch is a professional cabinetmaker classically trained in veneering and marquetry. He has taught decorative inlay for over 20 years. The video includes a step-by-step project and a 52 page companion booklet. 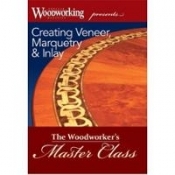 This is an excellent source of instruction for learning the basics of veneering. Running time: 80 minutes. Subtitle: "21 Original Designs with Full-Size Plans and Expert Instruction for All Skill Levels". From Kathy Wise, celebrated intarsia artist and contributor to Scroll Saw Woodworking & Crafts, comes an original collection of 21 FULL-SIZE patterns that capture the beauty of wildlife and the magnificence of the great outdoors. This exclusive collection will complement any skill level and includes 3 complete step-by-step demonstrations featuring a Rose, Mallard, and Lion along with tips on wood selection, tool use, and setting up your space.